Need a break from the hustle & bustle? Join us on a serene getaway to Muir Woods....because all of us need some nature therapy every once in a while. Explore Muir Woods & Sausalito with us! This tour requires a minimum of 4 people to run. Muir Woods National Monument is a United States National Monument managed by the National Park Service. It is located on Mount Tamalpais near the Pacific coast, in southwestern Marin County, California. It is part of the Golden Gate National Recreation Area, and is 12 miles (19 km) north of San Francisco. It protects 554 acres (224 ha), of which 240 acres (97 ha) are old growth coast redwood (Sequoia sempervirens) forests, one of a few such stands remaining in the San Francisco Bay Area. 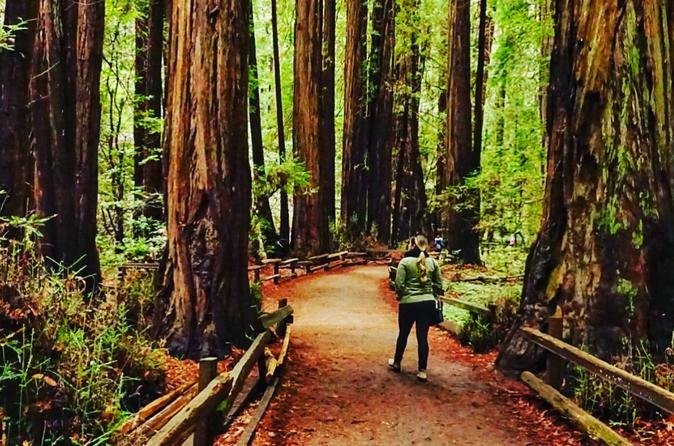 On our Muir woods you will get the opportunity to walk around for about an hour!